By grrlscientist on May 21, 2008.
from South America. This is a popular pet throughout Asia, especially in Japan. What constitutes a pet? Different people keep pets for different reasons, although I'll guess that companionship is likely the top reason for keeping pets. While I do enjoy the companionship of my pets, I enjoy keeping interesting animals as pets, and that means that, in addition to the large variety of mammals, birds, fishes and the few reptiles, amphibians and crustaceans that I've lived with and cared for, I have also kept a small variety of insects as pets, including ants, several species of stick insects, preying mantids, the local wild field crickets, several species of ladybugs, caterpillars, and aphids. But I just read about an entrepreneur, German Viasus, who lives in the South American country, Colombia, who raises and sells giant beetles to the overseas pet market. When I say "giant beetles" I mean it! These spectacular New World scarab beetles are as long as a person's hand and weigh as much as a golden hamster. Certainly, they are more fascinating than any creature that science fiction movies or television has cooked up these past decades. Fortunately, Viasus does not exploit the local wild beetle populations, many of which are becoming endangered, because he raises the Hercules beetles, Dynastes hercules, Neptune beetles, Dynastes neptunus, and Elephant beetles, Megasoma elephas -- the largest beetle species on earth -- on his farm, located 80 miles away from the capital, Bogota. His entire facility is less than half an acre in size, and is denoted with a large sign by the road that has a picture of a flying Hercules beetle on it. Viasus's involvement with the large beetles was serendipitous: he was originally a student in industrial engineering, researching methods for increasing the natural decomposition of chicken bones in an environmentally safe way when he discovered 56 small white eggs nestled in a pile of rotting wood. He didn't know what species of insect they were, so he kept them and waited for them to hatch. "I took care of those eggs as if they were my babies," he said. Even though the beetles did not consume chicken bones, Viasus thought the insects were interesting and began breeding them. But it wasn't until a group of Japanese businessmen first saw his beetles that Viasus realized that breeding and exporting them could be the basis of a successful business venture. His Japanese guests became extremely excited, exclaiming "pretty! pretty! pretty!" repeatedly at the sight of the insects. Viasus later learned that, in Japan, big beetles are good-luck charms and symbols of strength and tenacity. Additionally, beetles are protagonists in video games and comic books, and beetle-based cartoon characters adorn lunchboxes and children's pajamas much like Mickey Mouse does in the United States. Currently, Viasus exports his captive-raised beetles overseas to to Germany, Canada, China and Thailand, and especially to Japan, where they are all the rage, especially among young boys. Because Viasus owns the only beetle-breeding and -exporting business that is approved by both Colombian and Japanese governments, it is quite lucrative. Currently, he is allowed to export up to 300 live and 100 dead beetles each month. Dead preserved beetles are sold to museums, collectors and scientists in Europe while live beetles are generally exported to Asia as pets. Those that are exported to Japan fetch up to $350 for a live male -- considering that the adults live approximately 6 months, this is a very expensive pet! "If I produced 1,000 beetles a day," Viasus observed, "I could sell them all." Unfortunately for potential pet beetle owners like me, Viasus does not ship his beetles to the United States because the US Fish and Wildlife neglected one of his shipments, causing the deaths hundreds of his beetles, despite their having proper documentation. After hatching, the beetle larvae look like large white worms. The larvae live in 105-foot-long container filled with wood shavings and eat rotting ground-up fruits and vegetables. 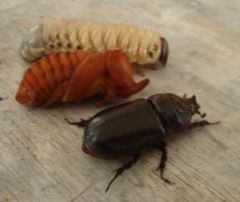 After the larvae reach six months of age, they are transferred to terrariums, where they pupate and emerge as the spectacular adults that you see in the image (above) and the videos (below) [see the three stages of a scarab beetle's life cycle, left]. 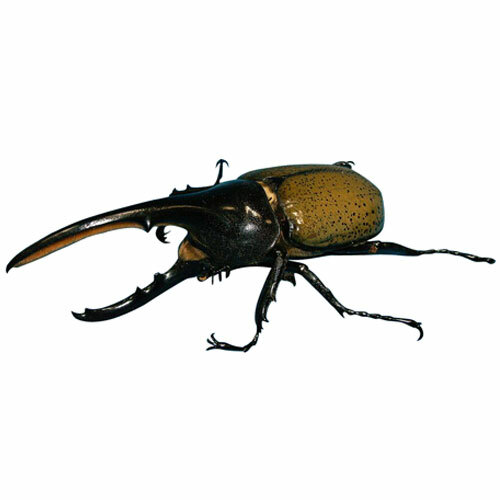 As you can see form the videos, the male Hercules beetle is approximately 7 inches long (the smaller female is roughly half that size). Adult pet beetles are fed on a diet of overripe and rotting fruits and jelly. Viasus chooses the largest and liveliest beetles either for breeders or for export to the pet market in Asia. After his breeding beetles die, at around six to eight months of age, he preserves them for sale in Europe. Despite the business aspect, Viasus is a man after my own heart, though, because he truly likes these insects; he still keeps some of them as his own personal pets. A few years ago the population reached the point of being completly unmanageable, and so she released all of them into the wild. Being Indian stick insects released in Britain, I doubt any of them survived their first winter. Actually Suricou I believe there are a couple of thriving indian stick insect colonies in the UK - there are certainly about 5 other species doing reasonably well in the south - all exotic releases. Releasing exotic species is seriously uncool whether they are expected to survive or not. Hello: Is necessary today that all people around the world can know about the true work that over 350.000 beetles make in the natural forest to benefit the humanity. Unfortunately, many people do not understand that in the beetles are the solution to the main problems of contamination that generate by solid organic waste. IÂ´m waiting support of the governments of the world to demonstrate my work. Stupid USFW. Even if $350 for six months worth of a pet is beyond me right now, if they were imported, I could at least /dream/ about having something so cool. That was very cool!Im doing a school project on beetles and i wanted to know more about them do you have any info about them that i could use? Dynastes neptunus, Dynastes hercules, Megasoma elephas and Megasoma mars were recently included in the red data list of endangered species in Colombia because these beetles are being sold and exploited by international insect traffickers from Canada, Japan, Germany, England and USA. Unfortunately in Colombia there are commercial insect farms like the one by German Viasus in Tunja, Colombia that exploit the local wild beetle populations from Muzo and Otanche and sells them illegally as "reared" insects many of which are becoming endangered by this unsustainable practice. The reason is that the life cycle of Dynastes and Megasoma beetles are to long (two to three years)and 90% of them die in captivity by viruses and entomopathogenic fungi making this rearing buisness unsustainable. That is one of the reasons German Viasus prefers to collect them from the wild to sell them as pets because he does not have to wait three years for the adult to emerge. This antiecological and illegal practice is putting the wild populations in danger of extinction. Plaease do not buy Megasoma and Dynastes beetles from German Viasus from Colombia. This farm is beeing investigated by the local environmental authorities. y'all should see the ladybug looking beetle in my house! It's the most beautiful one ever. like a great big gold and dark one with white ends coming out. Should I let it out side, kill some spiders for it or something?